Does a pure Tzadik like Rav Kanievsky need this? My intention is not to give free airtime to business person and rabbinic authority R’ M.G. Rabi (RMG) of Australia and his newest venture (Ben Pekuah farming) although that is inevitable. Those who follow RMG as their Rabbi did so with his many controversial views and will continue to do so. Good luck to them. It is their right and their choice. In my estimation the majority of Torah Observant Jews will not ever rely on RMG’s decisions especially now for reasons that have been documented in many arenas. On a recent overseas trip to seek agreement from authorities, RMG had many believe that he found approbation from the venerable 87-year-old sage Rav Kanievsky, son of the Steipler Gaon, and universally recognised as a pure Tzadik who sits and learns like no one else. Having heard this, including having personal direct knowledge of RMG’s words with acclaimed Halachists who refused his requests for support, I suspected, that Rav Kanievsky featured on RMG’s marketing and communication campaign. RMG has a habit of having his picture taken with a recognised Halachist. Someone who has seen RMG’s media and communications arm still promoting Rav Kanievsky as a supporter, please let me know, especially if Rav Kanievsky’s name and face are still displayed and I will make sure that Rav Kanievsky is informed dispassionately via a third-party about the context of the use of his name and picture. Rav Kanievsky has a right to know. Why do I say this? Because, like Rabbi Abraham from London and others who have found themselves superglued to RMG’s marketing, my view is that the number of respected Halachists who refuse to meet with him in the future will increase. This will not strengthen his position. RMG will counter with “This is not the way of Halacha”. I do not know who gave RMG license to pasken (Smicha) so we cannot ask that Rabbi directly if this is his way as well and that he approves of the path RMG has chosen to take. It could be asked if that Rabbi is identified and still alive.Does anyone know who it was? If they are alive do they feature on RMG’s websites? That being said RMG doesn’t have to follow his own Rabbi’s path as long as he is sure he is acting according to Shulchan Aruch. There have always been sole opinions in Judaism. Some opinions remain a Daas Yachid, when it is a respected Posek, others just disappear into the ether. It is well-known now that Rabbi Kanievsky has explicitly not agreed to RMG and the venture. If RMG wants to argue that Rav Kanievsky was “manipulated” then I suggest RMG should never have gone to see him in the first place for approbation! There are many Halachists of note who are not elderly, well aware of the issues and capable of agreeing or disagreeing with him. If it is now in the public domain that Rav Kanievsky has explicitly signed against RMG Ben Pekua farms, will RMG remove Rav Kanievsky’s name and face from his marketing and communications? If RMG does not, then I ask RMG is that “the way of Halacha” as RMG often writes and says. Categorically, and here there isn’t any question in my opinion, one must take down Rav Kanievsky from all marketing and communications campaigns in respect of RMG and his business investors foetus farms. One doesn’t even need to ask. Yiras Shomayim dictates it as does common decency. In response, the person said that “but your silence could be interpreted as agreement” (and this is a Talmudic dictum). The Rav responded that this might apply in a case where his lack of silence was actually listened to. However, this person was never going to listen to me or my opinion and was only interested to use my name as agreeing with him. That sort of person is entitled to his opinion, but he doesn’t need mine, and I have nothing to say to him as a result. Others may disagree and say the Rav should have acted like the common practice of Haredim and put out an open letter/poster disagreeing (the Rav did on choice public matters especially via the RCA and official positions) even against the opinion of his ex-students, who were now Rabbis of note. I’m guessing that the Rav didn’t feel this was to be used except for well-known broad policy issues because he did not feel he would be listened to based on letters or posters and the Torah would not be honoured in any way. I think the Rav was arguably right. A day doesn’t go by without some ban or disagreement signed by Gedolim X, Y and Z plastered in the streets of religious cloisters within Israel and the diaspora. These are ignored by those who ignore such things, and listened to depending on the range of those who signed and the issue at hand and the reader. That being said, if someone came to the Rav and simply asked a plain question he answered it. For example, some bugged the Rav about the Halacha of women’s head covering (the Rav’s wife didn’t wear one). The Rav, repeated and continued to repeat, “it is absolutely forbidden for a woman to go without a head covering”. The Rav was way too smart to be goaded. Another asked about dubious ways to repeal a marriage. The Rav came out strongly, and condemned the view as he saw it as dangerous. When someone came and said he was a Cohen and was in love with someone forbidden to the Cohen, the Rav said “you are forced to accept that it is forbidden, this is the Halacha”. There are many examples. He wasn’t a shrinking violet. 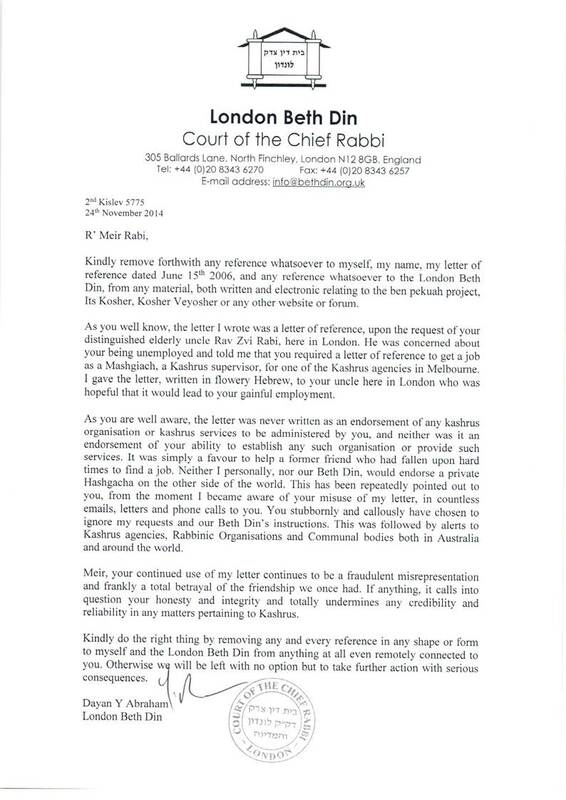 In conclusion, I think it is incorrect to place an alleged opinion of Rav Kanievsky, together with his picture for one’s business/supervisor/kashrus activities after Rav Kanievsky has explicitly signed onto a letter with other Poskim who disassociate themselves and are firmly in opposition to RMG’s Ben Pekuah farms. For the sake of Kavod HaTorah, he should take anything using Rav Kanievsky down from his web site. It cannot be the halachic way to use what is in black and white, even if RMG claims he has something else in black and white from before. The Halacha is that the upper level is stronger תתאה גבר and the lower level the תחתון is inferior. This situation isn’t the case of בשר בחלב that I quoted, but it has all the hallmarks of at best a misunderstanding of Rav Kanievsky by RMG or RMG might wish to argue that Rav Kanievsky changed his views. Whatever the case, his view is explicit in the widely circulated letter. Those Poskim are firmly of the view that RMG should cease and desist from his venture. Rav Kanievsky should however not feature any longer as someone supporting RMG. By all means let him find a bevy of respected Poskim who agree with him and explicitly write that they also approve of the Kashrus of that meat. Author pitputimPosted on December 22, 2015 December 22, 2015 Categories Daas Torah, Halacha, Politics, Rav Chaim Kanievsky, Rav Yosef Dov Halevi SoloveitchikTags Ben Pekuah, Honour of Torah, Rabbi Meir Gershon Rabi, Rav Chaim Kanievsky, Rav Yosef Dov Halevi SoloveitchikLeave a comment on Does a pure Tzadik like Rav Kanievsky need this? Thanks to the Internet we have all witnessed the disgraceful use and abuse of holy Rabbis who sit all day learning and can barely walk or talk while being cajoled to make statements which are blown out of all proportion by those who seek their approbation.These Rabbis often have no idea what they are getting into. They are being used. We saw this with Rav Elyashiv. We see this with Rav Kanievsky. We saw this with Rav Steinman, although despite his age, the latter has seen through the political chutzpah of many who have tried to manipulate his words. Were very powerful and showed he was a compassionate man who understood that those who had come to him were not the real McCoy but haughty people with Hats and Peyos. when you are in Yeshivah, your Posek may be your Rosh Yeshiva. R’ Chaim Volozhiner was not an opponent of R’ Schneur Zalman of Liadi. He in fact, while being the prime disciple of the Vilna Gaon, and the person who hand wrote the condemnation of Chassidim (Cherem) did not sign the Cherem! Rav Chaim Kanievsky is not a political person. He sits and learns and does little else. That this boor said “come and I will take you to Rav Chaim Kanievsky” does not mean that Rav Chaim was aware of agreed with the way he spoke or what he said. Rav Chaim is also a Mekubal who knows Kol HaTorah and if you look at what he signs, you will find dear Shmully, that he rarely if ever gives his own opinion. He is a humble man, who mostly says “if such a great person said X, then I (Rav Chaim, who he considers to be a “nothing” in his self-effacing way) join in. This is because he does not see himself as a leader. The one that you should be addressing is, in my opinion Rav Shmuel Auerbach, whose incredibly great father R’ Shlomo Zalman had more knowledge, feeling, sensitivity and greatness than his son by a country mile. As to the rest of them, and by “them” I mean ANYONE who can’t see the Godly soul of a Jew at all times (yes, this is something from Chabad that I am ingrained with) they will not change, not by your article or by our comments. The best thing that can be done is to work now with the Nachal Charedi and make sure it is the holiest battalion in the entire Army, and one which is a Kiddush Shem Shomayim BoRabbim. That, to me, is where ALL the effort should now go. The so-called “distaste” for those who aren’t yet frum (I loathe the word chilonim) is amongst the Religious Zionists as well. They too have much to answer for over the years in their preponderance with land over people. The two should have never been separated. Rav Froman ז’ל is an example of a Gush Emunimnik who was searing with love for others, just like Rav Kook. It seems though that hate is a catchy illness and love for others is an acquired and elusive taste. This has nothing to do with Brisk, save that R’ Meshulam Dovid Soloveitchik espouses similar views to that bigot on the plane, ironically his grandfather R’ Chaim Brisker was an even bigger Ba’al Chesed for a Jew than he was the Gaonic Genius of that generation. Check out his tombstone in the Warsaw Cemetery. I write to you in your capacity as one of the leaders of the ultra-orthodox Jewish community of Israel, often referred to as the haredi movement. On a flight last week from Israel to New York, I had a rather disturbing conversation with one of your of disciples. The individual was an ultra orthodox Jew and a successful Swiss real estate developer who resides in Jerusalem with his wife and seven children. He was on his way to New York for the wedding of a relative. I was returning home from Israel where I had spent the day attending the funeral of the father of a dear Israeli friend of mine from Yale, where I am the campus rabbi. I had met the deceased last year at his son’s wedding in Caesarea, where I was honored to officiate. On a subsequent trip to Israel I had put Tefillin on with this 77 year old man, preceded by an in-depth theological conversation about his Judaism and beliefs. On this return trip to Israel it was at the Shiva house where, upon meeting many of the members of my friend’s F16 squadron, a troubling conversation began. This was a conversation that crystallized on the flight back to New York while talking with your disciple. Israeli air force pilots are in their mid-20s and 30s, a ripe time for young people to be seriously dating and in many instances newlyweds. It was ironic yet promising that despite being in the shiva house of my friend, we found ourselves discussing weddings and choices of rabbis. Here I was, surrounded by Israel’s bravest military officers, who held the most coveted spots reserved for only the brightest and best, that I began to hear about one particular pilot’s wedding. He had just returned from a trip to the US where he got married in a civil marriage ceremony in City Hall of NYC. He explained that he, like many of his friends, had done so because they had nothing in common nor any dialogue with the rabbis of Israel. I reminded him that on that particular morning we had witnessed three Israeli rabbis bury our friend’s father, a total stranger. I continued to point out some of the many great things rabbis were doing in Israel. In vain, I tried to shed some light on the rabbinate and build a bridge to this rather secular group of Israel’s elite. Listening to him describe the gap that sadly divides the secular “chiloni“ and ultra-orthodox “haredi“ leaderships of Israel, I was dismayed and saddened by how far this split has actually wedged a division among our people. Could we have reached such a low point in our history that Jews living in our ancient homeland were flying across the world to avoid having to engage with our very own rabbis? How ironic I thought it was that I, an American rabbi, had flown to Israel first to marry and now bury a son and father of the most secular type of Israelis. Would this young pilot’s first encounter with an Israeli rabbi be at his own funeral? Harav Kanievsky, I am convinced that the fault lies largely with us, the “religious,” and less so with them, the “secular. “ In fact I don’t believe there is an “us” and “them.” I was born a Chabadnik, where we are taught that there is only one Jew in the world. Yes, one Jew. But it wasn’t until the conversation with your disciple on my return flight that I began to comprehend the mindset that actually fuels this terrible divide. It is for this reason, and with hope of healing this terrible National wound, that I write you this letter. I was so shocked by the venom he was espousing in front of his wife and 16 year old son that I felt like stopping the conversation right there just to avoid embarrassing him. This verbal assault on the majority of Jews alive and the Jews who I consider my dearest constituents was not going to pass without a fatal blow. One, of course, I would have to deliver with love. This man was by no means a Torah ignoramus, nor lacking in any level of sophistication. He was clearly a successful businessman, philanthropist, and learned Torah scholar. “I’m not sure you can blame a Jew for eating pork if that is what he was brought up eating,” I replied. It was an elementary response to such a loaded attack. He replied, “well Esau, despite being the son of Isaac the patriarch, was the enemy of the Jews,” as if to suggest that any secular Jew had the status of an enemy. I explained that the Torah explicitly tells us that Esau and Ishmael had abandoned the ways of their parents’ home and clearly attained the status of another nation early in our history. To suggest that every non-observant Jew in Tel Aviv born to non-observant parents, or simply brought up in a non religious home, was now the enemy, was ludicrous. He would not concede. “The Finance Minister of Israel [he refused to mention him by name] is a pork eater, the son of a pork eater, and will suffer for the terrible anguish he is causing our community. He is no different than Jesus whom, though born to Jewish parents, is responsible for the murder of so many Jews through European history.” I reminded him that according to one account in the Talmud, Jesus left the seminary because of the lack of sensitivity of his Rabbi and perhaps that was why Christianity started to begin with. I reminded him of the commandment to love thy neighbor as you love yourself–to no avail. As I sat there I started to comprehend why my new friend from the squadron had flown to NY to have his wedding. How could he have any respect for Jewish leaders that did not officially declare this type of talk absolute heresy? Who could stomach this unapologetic self hatred by a “religious” Jew. All in the name of Torah and G-d! What if I told you that the current President of Yale is named Peter Salovey, short for Saloveitchik? Though he is not particularly observant by your standards, he is a direct descendant of Reb Chaim. He is a dear friend of mine and despite being of the more secular type, he is extremely proud of his Judaism. In fact, he proudly quoted the great Mishnaic authors in his inaugural address as President of Yale. Do you know that he often engages in Talmudic discussions with me and others of the Yale community? Would you dismiss, excommunicate, and forsake the grandchild of the holy Reb Chaim of Volozhin in your self-righteous pursuit of an Israel that excommunicates the non-orthodox Jew? I envy you so much my dear Shmully, because in the merit of showing unconditional love to his grandson, I assure you that when you die, the great Reb Chaim of Volozhin will be waiting for you in heaven, and he will single-handedly open the gates of Gan Eden for you to enter. What would Israel look like this Pesach if you asked each and every one of your followers today to invite one non religious friend for Pesach? How amazing would it be if 1 million non orthodox Jews came home tonight and told their spouse that their religious friend or acquaintance invited them to their Seder? What if we reinterpreted, “all who are hungry may they come and eat, all who are needy may they come and enjoy Pesach,“ to mean, “not only the physically or materially poor but those less observant than us”? Just as I’ve been assured that Chaim of Volozhin will be waiting for me in heaven, I sincerely hope Schneur Zalman of Lyadi is waiting for you. Let us hope there will be no need to imprison 1 million Jews but rather have 1 million more guests this year at the Seder. I look forward to embracing you on my next trip to Israel.